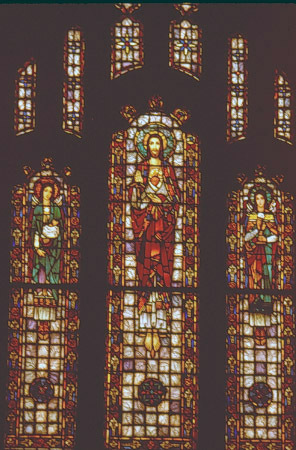 Brief Description of Subject: The center panel depicts an image of the Sacred Heart of Jesus. The side panels depict Angels holding symbols of Jesus: left is a manger and right is Eucharist. There are roundels in each panel that are under the feet of each figure. The background is white with vitreous and antique with an ornamental border.